Earn some extra money for your Christmas Shopping! 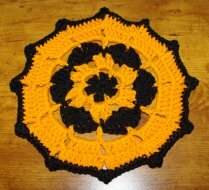 Learn how to make money from your crochet and knitting projects. * How to choose yarn that will make your products irresistible, and where you can find the most popular yarn choices from reviews of over 4,500 different yarns! * The critical elements to pricing -how much you should charge and how to make get people to pay you more! * FREEBIES LIST - you can easily start on a shoestring budget with these comprehensive listings of amazing free online resources! You'll discover free knitting patterns, free crochet patterns, free software, free website builders, free advertising, free advice, free mentoring, free blogging, free shopping carts, free business cards and so much more! * How to stand out at craft-fairs and markets, and make your stall into the cash-cow it should be! Click Here to get the Guide that explains it all. 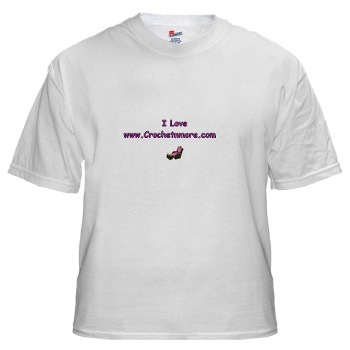 We are still working on making the Crochet N More Website and Newsletter better. Thank you for your feedback on our recent issue. Your patience and feedback is very much appreciated. I remember seeing it in a striped pattern. 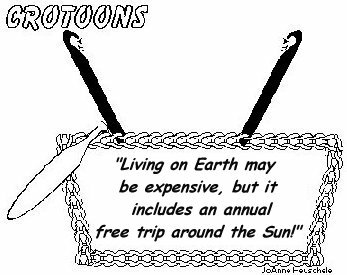 I haven't been able to locate a crochet pattern for a miser purse made with a sock. or even that all people go to heaven. Do not be fooled by those lies. unless they accept the mercy offered by Jesus Christ. Depart from evil, and do good, so you will abide forever. For the Lord loves justice, and does not forsake His godly ones; they are preserved forever; but the descendants of the wicked will be cut off. The righteous will inherit the land, and dwell in it forever. The mouth of the righteous utters wisdom, and his tongue speaks justice. The law of his God is in his heart; his steps do not slip. The wicked spies upon the righteous, and seeks to kill him. The Lord will not leave him in his hand, or let him be condemned when he is judged. Wait for the Lord, and keep His way, and He will exalt you to inherit the land; when the wicked are cut off, you will see it. The tongue of the righteous is as choice silver, the heart of the wicked is worth little. The lips of the righteous feed many, but fools die for lack of understanding. It is the blessing of the Lord that makes rich, and He adds no sorrow to it. Therefore also God highly exalted Him, and bestowed on Him the name which is above every name, that at the name of Jesus EVERY KNEE SHOULD BOW, of those who are in heaven, and on earth, and under the earth, and that every tongue should confess that Jesus Christ is Lord, to the glory of God the Father. So then, my beloved, just as you have always obeyed, not as in my presence only, but now much more in my absence, work out your salvation with fear and trembling; for it is God who is at work in you, both to will and to work for His good pleasure. Do all things without grumbling or disputing; that you may prove yourselves to be blameless and innocent, children of God above reproach in the midst of a crooked and perverse generation, among whom you appear as lights in the world, holding fast the word of life, so that in the day of Christ I may have cause to glory because I did not run in vain nor toil in vain. "OUR WORDS HAVE THE POWER TO BUILD UP OR TEAR DOWN." Name Job's three friends who came to comfort him? Keep your yarn labels with the corresponding skeins of yarn. help you identify the correct color. Just thinking about you, as I sit here & crochet my little fingers to the bone - HUGE GRIN!! 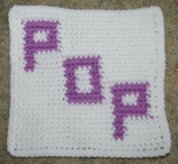 Not to brag - but to thank you further - I just wanted to share with you; a photo of the dishcloth that I created - with MANY thanks to YOU!! :-) It's a tad bit blurry, as my digital camera is palm sized & difficult to hold steady... however, you get the idea. So appreciative of the loan of your imagination, as well as completely impressed with your reply emails!! With blessings from above, I find a sense of peace with your farewell, re: "God Bless". It's always refreshing to find another Christian in what seems to be a "God forsaken world", at times!! Best of wishes, many prayers & much gratitude. Thank you so much for the crochet instructions on the internet. I was looking for increase and decrease instructions. We are making crochet items for the holiday bazaar at church and I would like to do different things but I did not feel comfortable with the different stitches. I got on the internet and your site was the first one I looked at. You have so many different stitches that I have heard about but did not know how to do. Your instructions are so easy to follow! I am going to crochet a lot of new things and am so excited. 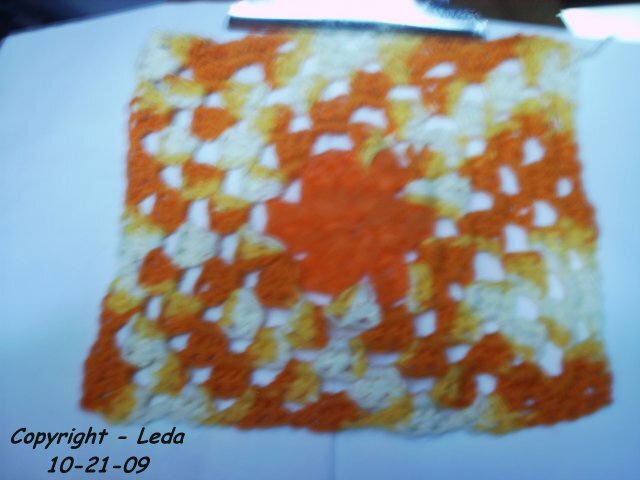 I am on the last row of a doily and directions say to do 3ttd in 5th ch from hook. Can you please tell me how to do that stitch. Thank You for any help you can send my way. Rhoda N.
3ttd is a stitch abbreviation I haven't heard of before. Sometimes "tt" is used in place of "tr" for a triple or treble crochet but I haven't seen "ttd" used except in Knitting. TTD in knitting is a triple twisted drop stitch. Is your doily pattern online? My name is Lydia and I was looking for patterns to make and sell in October and saw your coaster. I was wondering if I could use the pattern and sell it to raise money for cancer reasearch. I would buy the yarn and make them and cancer research would get the profit I would not and I have a few places here I can sell them I just need you writen permission please and thank you. 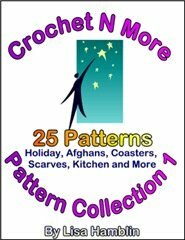 Yes... you may use any of my patterns to make items to sell. All I ask is my patterns not be sold or reposted to other websites. Thank you for asking and good luck. My daughter is having trouble understanding a crochet blanket pattern. It's instructing her to chain 3 space, chain 5 loop or ch-3 sp ch-5 lp. She's read the instructions numerous times. Please help. When a pattern refers to a chain 3 space or a chain 5 loop you are normally instructed to work into the hole beneath the chains. Send me the pattern language for that row and I'll be happy to explain it for her. I've listed the pattern language below. Ch1, sc in first dc, 5 dc in ch-3sp, *sc in ch-5lp, 5 dc in ch-3 sp; rep from * to last lp; sc in 3rd ch of beg lp; turn-22 groups of 5 dc. Thanks so much for helping with an explanation. 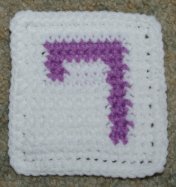 When you finish you should have 22 groups of 5 double crochet stitches. I have started over twice and it just doesn't look right. Those are instructions for rows 3-5 of a "bootie" pattern for adults. Single crochet in the next stitch. Work 2 single crochet stitches in the next stitch. You're missing a closing parenthesis on this instruction... I believe there should be a closing parenthesis prior to the word "around". By adding the word "around" after a set of instructions contained in parentheses this means you do the instructions contained within the parentheses over and over all the way across the row/round. 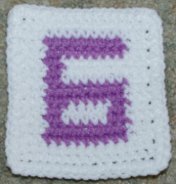 In this case you should have 15 single crochet stitches when you finish the row/round. This instruction is worked the same way. Single crochet in each of the next two stitches. Work 2 single crochets in the next stitch. Repeat that all the way around and you should have 20 stitches when this row/round is finished. Single crochet in each of the next three stitches. Work 2 single crochets in the next stitch. Repeat that all the way around and you should have 25 stitches when this row/round is finished. 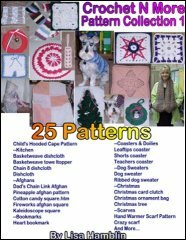 You may use any of my patterns to make items to give as gifts or to sell for a profit. All I ask is my patterns not be sold or reposted to other websites. I do appreciate you including the url to my website with each item made. And You Can Win an Elliptical Trainer! After spending most of a day shopping with her grandson, purchasing gift after gift, the final stop on her checklist was to take the boy to see Santa in the mall's center court area. At the end of their visit, Santa gave the tyke a small gift. When he said nothing, grandma prodded him, "What do you say to Santa?" "Charge it," the boy replied, confidently. A young girl of four had to have an x-ray taken at the medical office where I worked. She had been in an accident with her bicycle and the doctor was afraid she may have broken her wrist. The girl, however, was very concerned about the procedure and no matter how her mother tried to calm her, she kept putting up quite the fuss as we led her into the x-ray facility. My friend opened a ministry, using a snippet from the Bible as the name. But he soon regretted his decision to order office supplies over the phone. When his stationery arrived, it bore the letterhead "That Nun Should Perish." A lady dropped her handbag in the bustle of holiday shopping. An honest, little boy noticed her drop the handbag, so he picked it up and returned it to her. The lady looked into her handbag and commented, "Hmm.... That's funny. When I lost my bag there was a $20 bill in it. Now there are twenty $1 bills." The boy quickly replied, "That's right, ma'am. The last time I found a purse, the owner didn't have any change for a reward." My husband, an attorney, is frequently consulted by clients who, after learning what the cost of legal services will be, decide to do without his aid. Recently the elderly minister of a small, struggling church came in with a legal problem. After patiently listening to an explanation of my husband's fees, he left the office with a prudent: "Thank you, sir, but I believe I'll just pray this one through." My son, Mike, was attempting to build a patio for the first time. He bought 100 cement blocks. Laying them out in a pattern, he discovered the chosen area was too small. He stacked the blocks against the house and cleared more space. The next day Mike put the cement blocks back down, only to find that the ground was too hard to keep the patio level. Observing all this, our next-door neighbor asked, "Mike, are you going to put your patio to bed every night?" During court one day, the judge quietly passed the clerk a note reading: "Blind on right side, may be falling. Please call someone." Understandably alarmed, the clerk called for help the reassuringly whispered to the judge that paramedics were on their way and would arrive shortly. Puzzled, the judge pointed to a sagging Venetian blind on the right side of the court room and explained, "I was thinking maybe someone from maintenance!" I walked into Dairy Queen the other day and asked for a hot fudge sundae with extra hot fudge. The girl replied, "The hot fudge only comes in one temperature, ma'am." An elderly gentleman had serious hearing problems for a number of years. He went to the doctor, and the doctor had him fitted for a set of hearing aids that allowed him to hear 100 percent. After a month, he went back to the doctor, who said, "Your hearing is perfect. Your family must be really pleased that you can hear again." He replied, "Oh, I haven't told my family yet. I just sit around and listen to the conversations. I've changed my will three times!"